At Fraum Chiropractic Life Center, we provide patients with the treatment and resources they need to reduce pain and get back to living a life they love. Our services range widely to include only holistic approaches to healing and well-being. When you visit our chiropractic care center, you get the one-on-one support you need. Put your trust in our team today. A chiropractic adjustment is the skill of applying gentle force to the spinal column and joints. It’s one of the most effective methods for reducing pain and improving mobility. We use a range of chiropractic adjustments to treat underlying pain. Instead of focusing on the pain symptoms, our aim is to improve the underlying cause of your discomfort. This cause is often a misaligned joint or vertebrae in the spinal column. Nutritional therapy is the application of natural, holistic treatment that can help to trigger your gastrointestinal, endocrine and immune systems to begin working efficiently. This can help to improve pain and health complications. The goal is to help the systems in your body function optimally. This improvement will increase your level of health and increase your overall sense of well-being. We customize your treatment to meet your needs. If you’ve been hurt or are suffering from poor posture, your body has learned to move inefficiently. When it doesn’t operate in the way it was designed, your body will put pressure on your spinal column and other joints. Our corrective exercises will re-teach your body to move the proper way, reducing the risk of further injury and reducing current pain levels. Often, the pain that patients endure stems from lifestyle choices. Our goal is to help you to experience improvement by addressing the underlying cause of your pain. For example, some patients need help with weight loss to reduce strain on the knees and other joints. Other patients may work in challenging environments that lead to damage in the spinal column. We address specific concerns with you to help in creating an effective outcome. If you’re suffering from any of these limitations, contact our team for customized care. We offer whole-body improvement. Adjustments are also known as manipulation. The goal of a chiropractic adjustment is the application of a gentle force to a specific joint to improve its alignment. By doing this, we can reduce inflammation and the pain occurring from a nerve being pinched. Adjustments are gentle and can offer significant relief from pain and restriction. Over time, the spinal column compresses, pushing down on the cushioning discs that are located between each of the vertebrae of the spinal column. This compression creates pressure on the nerves and causes pain. Spinal decompression allows us to reduce that compression and pressure to decrease your pain. This therapy can offer significant pain reduction for those with low back pain and limited mobility. The improvement of your well-being starts with a consultation at our friendly chiropractic care center. And we can help with payment options that can make our care even more affordable. 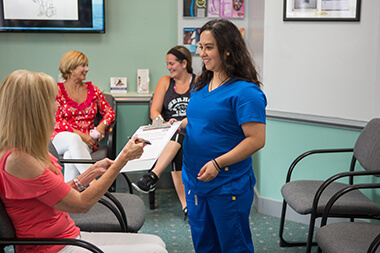 Reach out to our Hilton Head Island practice today for an appointment to learn more about how we can help you live a better life!